1. Except for indoor soccer, you can't bounce pass, so I made the edge jagged. I can't do out-of-bounds, but at least this penalizes you a little. 2. I put turrets in the goal, so don't go in the other teams goal box, you will be killed. Though, the right EMP might get you closer to the goal. 3. The map will work anywhere, but on Alti+ servers (like Team+), I doubled spawn to give you more time to pass the ball, and I also set you to spawn where you died. Unfortunately there isn't a white plane choice, so blue had to suffice. And, red matches up well for Arsenal, so I turned it into a North London derby. Last edited by biell; 03-21-2016 at 04:45 AM. Nevertheless, keep up the good work! looks cool except where are the team's benches and the referees? No referees, but the team benches are in the center on the bottom. I sized them down to fit. I wanted to put planes in them, but it didn't look right. And, I was running out of time to get the map out before I got too tired and needed to go to sleep. I am sure there will be a version 2, and I will try to get the player seets populated. I put up a server for this map "Football+", please post any suggestions on tweaking it here. Double health, and the spawn points seem to be working well. But, let me know if and why they should be changed. I have it set to no ball gravity, which I think works better than with ball gravity (though it does take some getting used to). Stuck it up on a Ledow server (#9), let me know if you update it. Biell, is there a reason the map is so large? It is 2.04 megabytes compressed in my map directory. 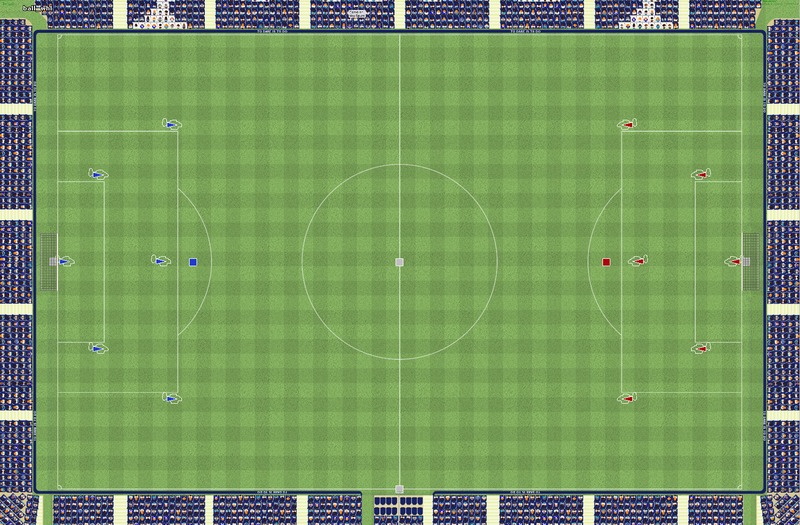 For an example of an average ball map, the map Eidum has a size of 1.17Mb, which is almost half of Whl. In fact, Football itself has just a size of 422 kilobytes according to Windows Explorer, so I'm wondering if the size should be cut somehow. When I had to redownload the map, I found myself a bit frustrated at the time it took for the game to download. I don't know if it is needed, but I think it would be a small improvement to somehow cut down on size. Thanks! Probably because of all the detail like the people in the stands. I don't see any reason to sacrifice quality for the sake of reducing map size. It's not like biell's updating the map every day. That's fine with me. It's only a one time download, anyway. It is not just the stands, but also how I insert them. I was meaning to chop the stands image up and make it more efficient. I simply just kept forgetting. If I have to make another change (which hopefully I don't) I will see what I can do about lowering the size. I don't always realize b/c I test on the server in my house, so a 2MB download doesn't even take 2 seconds. I did make a minor tweak to the map. There were a couple places where you could still get killed without touching the white goal box lines. It is really important to me that if you don't go in there, you shouldn't get shot at. So, I decreased the range on some turrets, but increased the damage to ensure players couldn't make it to the goal without emp. Gravity should be on. It's a core part of Altitude. With gravity on like on Ledows the top half of the map is barely used. The map is great for 3v3 and 4v4 matches. in football everyone just dunks the ball but the turrets prevent that. I think a smaller version without jagged edges would be great. Ledow's #9 has this map with gravity turned on. I think it should be turned off for the ball, and so it is on Football+. The map is pretty big, as you noticed, and I want it that way to open up space for passing. But, with it being so big, ball gravity works better with it turned off. Also, you noted the jagged edges, if gravity were on, I would have to get rid of those as the ball would bounce off the "floor" weird all the time. I really like this map, but the original ball_football has it's place too. I wanted it to be bigger with jagged walls and no ball gravity to differentiate the two. Otherwise, it is just a prettier version of the original. I think with a 6v6 or 7v7 match, the health needs to be higher to promote passing. Without it, you die too soon to effectively pass. However, you are totaly correct about 3v3 and 4v4 matches. A while back I added a scripting interface to the alti+server. This was a perfect opportunity to use it. Now, I have a script added on the Football+ servers which will set the spawnHealth to 100 for a match with 4 or fewer players. It will set spawnHealth to 200 for a match of 12 or more players. In between, it will gradiate from 100 to 200 based on how many players are assigned to teams. I think this should solve your concerns and hopefully always promote passing.